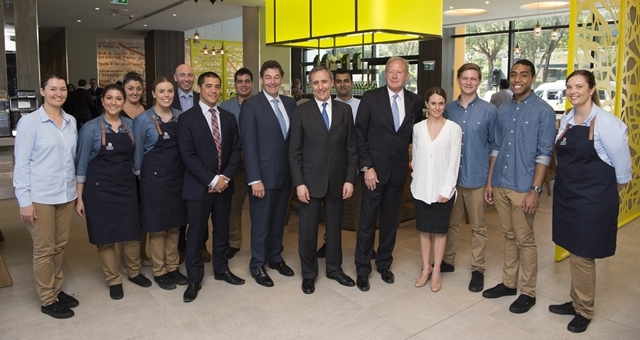 InterContinental Hotels Group (IHG) in partnership with investment group, Pro-invest has this morning (Mar 30th) celebrated the opening of Australia’s first Holiday Inn Express hotel, Holiday Inn Express Sydney Macquarie Park, scheduled to welcome its first guests on 11 April 2016. A ribbon cutting ceremony marked the occasion, attended by IHG Chief Executive Officer, Richard Solomons, Pro-invest Chief Executive Officer, Ronald Barrott, and New South Wales Minister for Trade, Tourism and Major Events, the Hon. Stuart Ayres MP. Holiday Inn Express Sydney Macquarie Park is the first of 15 Holiday Inn Express hotels to be developed in partnership between IHG and international investment group, Pro-invest Group under a Master Development Agreement. Additional key locations for properties in the portfolio have been secured in Spring Hill, Brisbane (226 rooms), Hindley Street, Adelaide (245 rooms) and Southbank, Melbourne (345 rooms). “IHG’s global strategy is to align the right market with the right brand at the right time – and with the right partner. With a strong tourism economy in place, coupled with a receptiveness to a select service accommodation brand in this market and a dynamic partner in Pro-invest Group, Australia presented as an ideal opportunity to continue the growth of Holiday Inn Express. “A brand synonymous with offering guests a great experience and everything they need but nothing they don’t, coupled with friendly service, Holiday Inn Express will no-doubt prove popular among smart, discerning Australian travellers,” he said.